Indiana Breast Cancer Awareness Trust awarded a $13,500 grant for the Francine's Friends Mobile Mammography program. Funds will be used to help provide mammograms for women who, without this assistance, would not be able to afford this life-saving cancer screening. 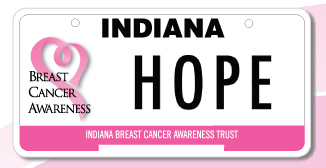 The funds are raised by the IBCA Trust through the sale of the Indiana Breast Cancer Awareness license plate. If you bought a plate, Francine's Friends, in partnership with Parkview Comprehensive Cancer Center and Breast Diagnostic Center, wants to thank you!